From the duo behind Embrace of the Serpent comes another extraordinary movie full of ethnographic detail and mystical symbolism. In Birds of Passage, a revenge tragedy plot involving the burgeoning market in weed is transformed into a riveting form of acid western. 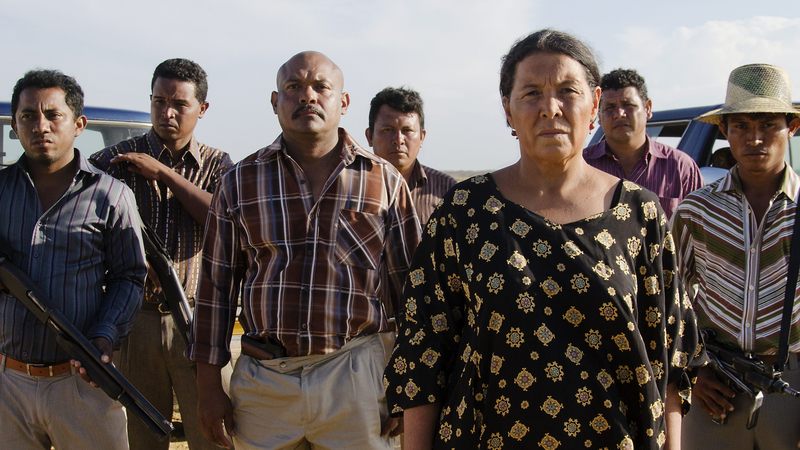 Set in the arid coastal Guajira region of Colombia, among an indigenous people known as the Wayuu clan, the film takes place in a twenty-year period immediately after the years of La Violencia – a bloody civil war where hundreds of thousands were killed – and ends just before the start of the 1980s narcocracy headed by Pablo Escobar. Working within the parameters of the crime epic (the film is a rags-to-riches-to-eventual-ruin narrative), directors Cristina Gallego and Ciro Guerra use a genre template as a device to explore and examine loss of indigenous cultures. The Wayuu clan has resisted or ignored attempts at assimilation; their moral codes, rites, rituals and customs unchanged for so long, the elders boast of having beaten the English, the Spanish and modern day governments. It isn’t cockiness on display, just their rich and justified history of nonconformity and ingrained resistance to western ways. Told in five chapters (titled as Cantos, to reflect the singing tradition of the tribe), the story begins in 1960 with a young Wayuu man needing a dowry to marry his intended. He takes a punt on arranging a shipment of marijuana to American Peace Corps stoners and from there he becomes the region’s lead narco-trafficker. When an alliance with a cousin, a fellow dope smuggler, ends in unnecessary mayhem, the wheels of reprisals and mistrust begin to turn rapidly, and blood always demands blood. The focus on the Wayuu’s simple lifestyle out in the sticks, how they are guided by conversations with their dead ancestors or rely on dream interpretation to decide courses of action provides Birds of Passage with a ghostly, occasionally surreal atmosphere and sense of entrapment, stuck as these people are between the ocean and a world they do not understand. The desert-like Caribbean locations captured in glorious widescreen and sumptuous colour are very unusual when compared to the Colombia we’ve seen many times on our screens – the verdant valleys, sweatbox jungles, overcrowded cities swimming in abject poverty and outlandish country estates (fincas) bought with coke money. The Wayuu’s homeland feels so far away from all that. In the age of Netflix’s Narcos and umpteen television documentaries and series on Escobar and others, Colombians are sick to the back teeth of filmmakers exploiting their troubled past, but Gallego and Guerra’s inspired take on the blood feud yarn and mob thriller is really unique and far from cheap genre thrills as it gets. Birds of Passage is an enthralling, powerful statement and lamentation on the drugs trade’s inevitable encroachment upon on indigenous peoples and how gangsters casually destroyed them.